The PepsiCo Foundation recently awarded Randolph College a grant from the 2017-18 PepsiCo Recycling Zero Impact Fund. Randolph was one of 19 schools from across the nation selected from a pool of more than 60 proposals. 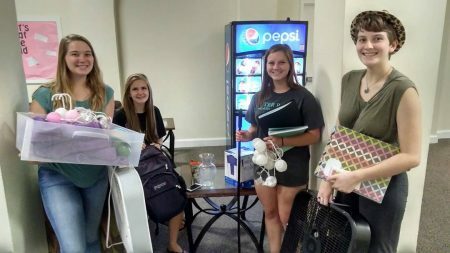 The $3,480 grant will help expand Randolph College’s Rummage Room, located in Room 366 of Main Hall. The Rummage Room is a space where students can donate usable items and furniture they no longer need when they move out at the end of the academic year. In turn, new and returning students can look through the selection and take the supplies, free of charge. In addition to Woodward, Marie Abowd ’19 worked to develop the Rummage Room and helped write the grant. The grant will allow the College to expand the collection aspect of the Rummage Room program. In its second year, PepsiCo Recycling’s Zero Impact Fund aims to help schools across the country reach their sustainability goals by awarding up to $10,000 to support eco-innovations that increase sustainability on campus. For more information on the PepsiCo Recycling Zero Impact Fund and other winning proposals, visit PepsiCoRecycling.com.